“I think you'll find this particularly enlightening - press play and enjoy!”, they said. What filled my ears was a joyous sound that immediately made my heart race. Was I hearing what I thought I was hearing? A sound experienced (sic) by so few and a sound which is rarely without the encumberment of other instruments masking the genius. It was the sound of Jimi Hendrix’s guitars for All Along the Watchtower. The first 4 minutes is a take with drums, acoustic guitar and bass sitting underneath Jimi's electric guitar track but without the vocal to mask the unheard intricacies of his verse fills. 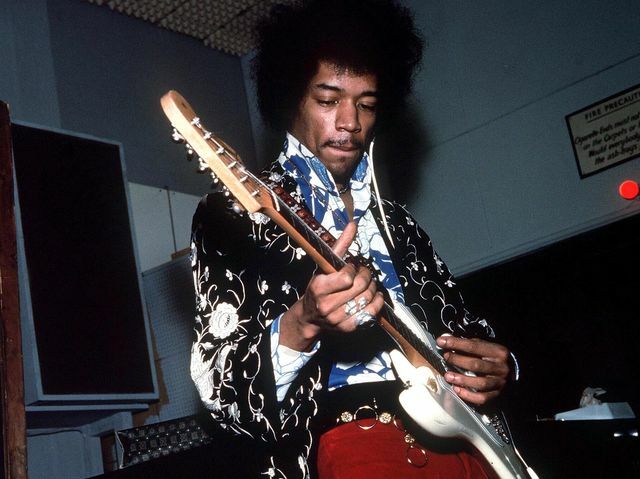 The trained ear can also detect the change in tone as Jimi switches pickups (from middle to neck) for his solos. The closing minute includes an unused solo that reveals Jimi's iterative process for his solo on this track: shades of what is to become the final version can be heard here as Jimi works through his ideas before crystalising them into the version you know and love. The next 4 minutes focuses on Jimi's electric guitar with heavy reverb already printed to tape. Other instruments and the vocal can be heard bleeding through. If you had been sitting in the control room at Olympic Studios on Jan 21, 1968. It would have sounded like this. 0:00 - 4:11 Close to the finished track: Jimi's electric guitar, bass and drums (no vocal) + unused solo towards the conclusion of the song. 4:13 - 8:27 Focused on Jimi's guitars only: Jimi's final electric guitar track (bass, drums and vocal bleed through slightly) plus Dave Mason's acoustic guitar in places. Self taught intermediate guitarist feeling lost? My 10 day guitar course will sort you out.